One supermarket part of the Dutch chain Spar is now officially accepting Bitcoin via a quick and easy payment processing system. This is the first one of the brand’s supermarkets in the Netherlands to accept cryptocurrency payments. With this move, the supermarket wants to boost the adoption of digital money in the city of Arnhem (near the Central Station) and in the country. This franchised Spar shop is now part of the Arnhem Bitcoincity project, launched in May to encourage the city’s merchants to take Bitcoin payments, and also of a massive national effort that includes the creation of a Bitcoin Boulevard in The Hague, for instance. The Arnhem supermarket is one of the 40 businesses in the city that accepts digital money, an impressive number even in the Netherlands. NU.nl reports that the system put into place by the Arnhem store to help customers with their first BTC purchases in the ‘real world’ is quite simple. A statement that is confirmed by Luke van Gelder, the owner of this Bitcoin-friendly supermarket. 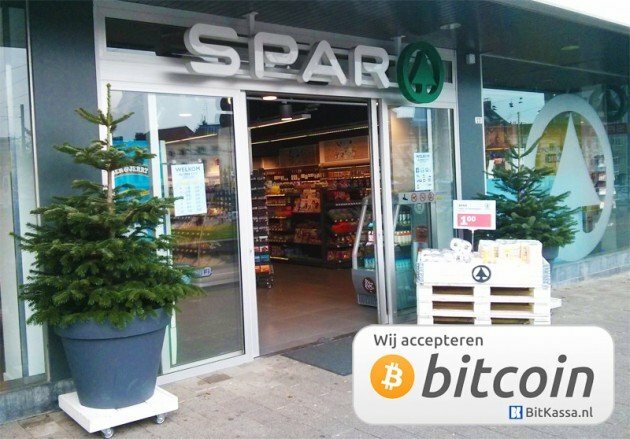 Spar is the first known shop of a large chain in the Netherlands that accepts Bitcoins. Bitcoiners can load the payment on their mobile phone or tablet. The supermarket has a tablet on which the amount is struck. The buyer takes out his phone and uses the code to make the payment. Gelder revealed that the store will be processing the payments via a point-of-sale system provided by Dutch firm BitKassa. Also, the supermarket has decided to convert the cryptocurrency into Euros, which are later deposited into their bank account. “It seems like an interesting project, and fun to support. I don’t personally expect to gain a huge amount of extra revenue by accepting Bitcoin, but perhaps we’ll attract a couple of new customers this way”, the owner of the supermarket told Coindesk. In the first two days after starting accepting cryptocurrency, the store processed about 10 payments.